At a 300% efficiency rate, a ground source heat pump will prove a cost efficient as well as an environmentally friendly investment that will help you save up to 40% on heating bills compared to conventional heating systems. 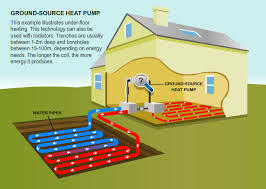 How a ground source heat pump works A mixture of water and anti-freeze is pumped around the ground loop and absorbs the naturally occurring heat stored in the ground. The pump itself consists of an evaporator, a compressor and a condenser - together these take the heat from the water mixture, transfers it to your domestic heating system and increases the temperature in the process. A ground source heat pump increases the temperature from the ground by between one and a half and four times – so if the ground temperature is 12°C, the output would be between 18 and 48°C). 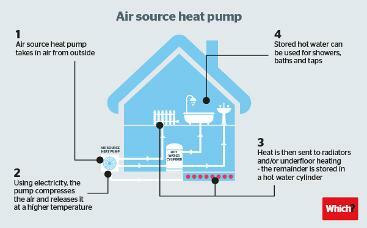 An air source heat pump (ASHP) is usually placed outdoors at the side or back of a property. It takes heat from the air and boosts it to a higher temperature using a heat pump. The pump needs electricity to run, but it should use less electrical energy than the heat it produces. Many air source heat pumps are eligible for payment through the Renewable Heat Incentive, a government scheme that provides payments to homeowners who generate their own heat. Add some style to your home with a luxury bathroom A stylish new bathroom can add a touch of class to your home. 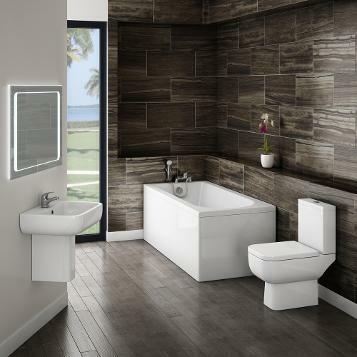 If you are thinking about getting a luxury bathroom fitted or slight bathroom refurbishment, then get in touch with us. 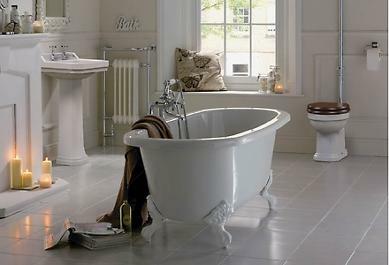 We'll give you a free, no obligation quote, and can do as little or as much to change your bathroom as you want. Having a good looking bathroom really can add a lot of value to your home. If you want a completely new one or bathroom refurbishment, it will not only be good for you to enjoy but when it comes to selling your home, potential buyers will love a luxury bathroom. B L Heating & Plumbing services offer competitive pricing of domestic gas services to homeowners, landlords, letting agents and insurance providers. We offer service, repair and installation of most natural gas and lpg appliances including Combination boilers – conventional boilers – system boilers – water heaters – cookers – hobs – fires – wall heaters. 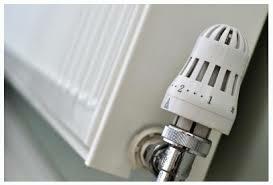 We also install and repair heating systems and components including Radiators and pipework – system controls – unvented and vented cylinders – gas supply. Landlord certification ( cp12 ) – kamco power flushing and system cleansing – gas leak location. Boiler servicing plays an important part in keeping your heating system working safely and efficiently. It is recommended by most manufacturers that you have your boiler serviced annually, and is generally required to keep any current warranties valid. B L Plumbing & heating services will ensure that your boiler is working as efficiently as possible and will advise you of any faults or defects. We are able to service all boiler types including combination boilers, system boilers, conventional boilers, wall hung boilers, floor standing boilers, back boilers, condensing boilers and more. Boiler repairs are unfortunately sometimes necessary. If you are unlucky enough to have a boiler fault, B L Plumbing and Heating services offer the best possible solution. We have extensive experience repairing all manufacturers’ boilers and offer honest repairs. Our knowledge ensures that you will receive the most cost effective fix, able to diagnose faults quickly, and repair or replace parts more efficiently than the average installer!